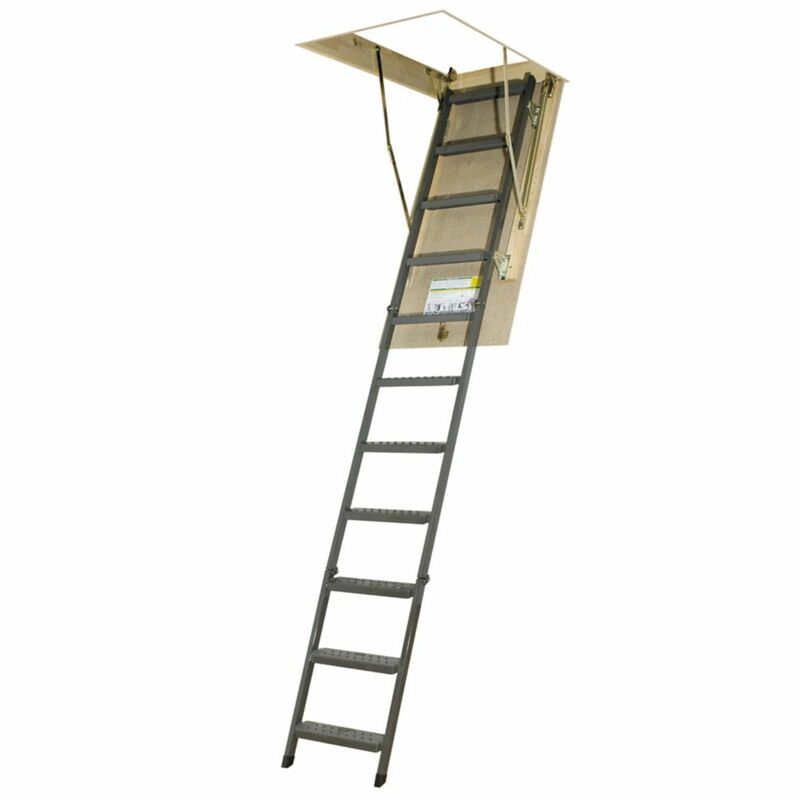 Attic Ladder (Metal Basic) OWM 25x54 300 lbs 10 ft 1 in The OWM powder-painted, ANSI approved, metal attic ladder is assembled in three sections. The OWM is equipped with a locking mechanism that is installed inside the door panel. The length of the ladder may be adjusted within 1 inch after cutting the side rails to set the ladder evenly on the floor. The construction of the attic ladder provides more steps (tread rise about 10 inches) to improve safety and comfort. A red, metal handrail is available for purchase and may be installed on either side of the ladder. Brackets allow adjustments to increase space between ladder and attic door for comfort and safety. Springs are located on door surface to make entry to attic wider and more comfortable (the widest entrance on market - compare to other products). Door is well balanced - it opens and closes easily (NO sudden movements). Fits rough opening 25 in. x 54 in. and ceiling heights 7 ft. 11 in. to 10 ft. 1 in. Attic Ladder (Metal Basic) OWM 25x54 300 lbs 10 ft 1 in is rated 2.3 out of 5 by 4. Rated 4 out of 5 by Patty from No instructions included Nice ladder. What I was looking for but no instructions to construct other than cutting hole into ceiling. That's where they stop. Probably okay if a contractor is installing but for average home owner, no further instruction. Rated 2 out of 5 by angrydog from Solid, sturdy, but needs stronger springs! Ladder goes in easliey, feels very sturdy, but is heavy, and the springs are not strong enough to help lift that weight. When you unlatch, stand clear, it basically falls to the open position, and requires strong arms with a long 2x4 to lift closed to the latched position. Once open, it's easy enough to unfols and fols the stairs and use. I hope to modify somewhat to make the opening and closeing process safer, anyone standing under it would be injurerd when they unlatch the door and it falls open. Rated 2 out of 5 by Bob from Tell FAKRO to get rid of the Paticle Board Tell FAKRO to get rid of the Paticle Board, it is cheap and sub standard for the application. It will not hold the screws needed to secure the latch. the rest of the package is well done but particle board degrades what could be a superior product. My Contractor was impressed with the steel ladder, the strong framework of the Wood Mounting but not of the Door 5/8" or 3/4" Plywood would make this worth a few dollars more.